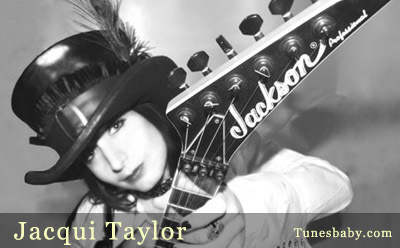 Since an early age, Jacqui Taylor has devoted her life to music. Jacqui was born in Kingston-upon-Thames, Surrey, England. At the age of eight she started her classical training on the piano, which won her various awards. Although this formed a good basic foundation in music, she still felt it was lacking the creativity she was searching for. After experimenting with various instruments, including the violin, she finally found the creative outlet she needed, in the guitar. Since completing her degree in music at the University of Brighton she has become an accomplished composer/musician. Composing for various dance companies, she has won awards, and has had her works performed throughout the UK. Jacqui has met and worked with many musicians and has composed works in a variety of styles including classical, contemporary, rock and alternative. She has recorded and produced two of her own albums 'Free Spirit' and 'Brain Candy'. Exploring her own creativity and expression without restraint, these are instrumental guitar pieces bringing forth the true essence of her love for the guitar. Jacqui has been teaching the guitar for many years. She enjoys encouraging others to explore their own creativity and self-expression. At present Jacqui is the guitarist for the band Razorbladekisses who have just signed to the American record label Final Joy Records and are about to release their debut album, she also is the lead guitarist for the band Noisy Toyz and, independently, she is working on her own third album.